Observation - Unidentified crustose lichen - UK and Ireland. 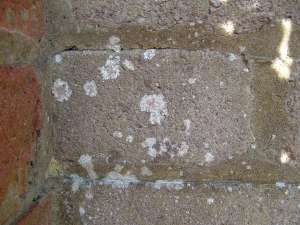 Description: White/grey crustose lichen, in small patches of 2mm-1cm, on northwest facing wall in suburban garden. Seems to be noticably more present on the grey bricks than the adjoining red bricks - not sure if this means anything? White/grey crustose lichen, in small patches of 2mm-1cm, on northwest facing wall in suburban garden. Seems to be noticably more present on the grey bricks than the adjoining red bricks - not sure if this means anything?